BRAZIL GOES SHOPPING ON GERMAN WAR INDUSTRY. Before beginning a study on the negotiations that would culminate with the acquisition of German and American armament for the Brazilian Army, one has to have a notion the situation in which this one was on its equipment. In the late 1930s, the War Ministry found enormous geographical and infrastructure barriers that prevented it from having greater control over its units scattered throughout the vast Brazilian territory. The difficulties of transport and communication that existed at the time made it difficult, for example, to have a precise inventory of the quantity and state of maintenance of military equipment, which consisted of a miscellany of armaments and vehicles of different origins, times and, in the case of weapons, different calibers, which made the supply of them a true logistical nightmare. Both General Góes Monteiro and the minister of war, Eurico Gaspar Dutra, wrote several letters and reports addressed to President Getúlio Vargas, reporting on the problems of armament and training of national army troops. Dutra reports on the shortcomings and material needs of the country's defense, while Góes Monteiro concentrates on valuing a new military structure, exposing the weaknesses of the army against the probable enemy. The explanations of Góes Monteiro are intimately linked to the precepts and theories of the war of his time, where the list of potential enemies is sought, their probable alliances and, taking into account the equipment available to each one of their forces, a possible unfolding of the fighting is projected over time. Taking this information as a basis, the aforementioned general seeks a defense plan combining the elaboration of a doctrine of employment in own combat with the acquisition of new equipment and the creation of new military units. To the reality of Monteiro and Dutra, the potential enemy was not on the other side of the Atlantic, but on the other side of the triple border. Argentina, Uruguay and Paraguay are considered as the main potential enemies. The Argentines, because of their great influence on the two other countries mentioned, would be the greatest danger against the Brazilian pretensions in the south of the American continent. The situation of delay and lack of preparation of the Brazilian Army were remarkable. The potential enemy, Argentina, had a larger army, better equipped and trained than the Brazilian. While the Argentine war industry sought to develop and produce its first tanks, the lagged Brazilian manufacturing facility could not even meet the ammunition needs of the local land force, which made ammunition stocks insufficient and precarious. However, well beyond the lack of equipment, the lack of effective training was remarkable. Combat maneuvers from the "French Military Mission" of 1919 were still adopted, based on fixed defenses and the concentration of large infantry units. The French doctrine, followed by the army officer, was totally ineffective. He was unable, for example, to stop the Prestes Column (1925-1927) and the 1930 revolutionaries march. There was still no doctrine for the use of the recent armored weapon. The already lagged French tanks Renault FT-17, acquired in 1921, were almost all without operational conditions. The newly acquired Fiat Ansaldo CV3-35, as well as its French predecessors, were all concentrated in the federal capital, not the border region. Thus, the entire armored weapon of the army was much more a tool of intimidation and repression of the state than a weapon for war itself (Note the use of the FT-17 armor by federal troops during the Constitutionalist Revolution of 1932). Once again it was easier to negotiate with Germany than with the United States. The explanation is simple: while the US government was concerned to re-equip its armed forces with what was most modern in local industry without having to hide it from anyone, the German government needed to put its industries to work in a warlike manner, camouflaging the rapid expansion of the war park with exports of this type of equipment to other countries. To this end, it accepted the payment of up to 75% of the amounts through the compensated landmarks, which Brazil had a high sum. In addition, the Americans were only willing to sell "scrap" to Brazil, since the material offered was lagged and was being withdrawn from service in that army, refusing to negotiate any modern weaponry while the German material was new, coming straight from the factory and composed of what was most modern in the powerful German war industry. A plan was then created for the refurbishment of the Armed Forces. The release of the values ​​for the purchase of material was made in November 1936, in a total of one million five hundred million réis that should be invested over 10 years. For Brazil, the possibility of paying part of the total amount through compensated frames was important. It is worth remembering here that the Vargas government was still in its dubious policy of approaching both Germany and the United States, and purchases of war material were not excluded from this policy. As a result, Brazil acquired modern field and anti-aircraft artillery pieces from the German company Fried Krupp, and at the same time acquired second-hand material from the US government for its coastal artillery. Both contracts, both German and American, provided for Brazilian self-sufficiency in the production of ammunition for cannons, since it would be practically impossible for Brazil to acquire this material from supplier countries in case of war. After many negotiations and readjustments of quantity and price, in March 1938 a contract was signed with the German company Fried Krupp, which provided for the delivery of 1180 artillery pieces (guns and howitzers) of various calibers, as well as hipo mobile vehicles for traction , transport of ammunition and the garrison of the respective parts, ammunition for combat and training, production rights and the machinery necessary for the production of ammunition. But the contract with Germany also included companies producing cars, trucks and military tractors. Fried Krupp itself was part of the vehicle purchase agreement, as was Bussing Nag Vereeinigte Nutekraftwagen, Daimler-Benz, Henschel & Sohn and Locomotivfabrik Krauss & Comp. This contract entails the ordering of 646 automotive vehicles for the traction, support, and transport of artillery ammunition for the parts ordered from Krupp. Although grandiose and expensive (the largest contract for war material ever hitherto made), the contract with German companies still fell far short of the real need of the Army. They provided the most urgent details for the defense of the regions of great importance to the government: the Rio-São Paulo axis and the border with Argentina. A commission was formed which, sent to Germany, would inspect the process of manufacture, receipt and shipment of the material manufactured, as well as the firing tests of the versions developed to meet the Brazilian requirements. This commission closely followed the development and manufacturing of the parts, reporting the results of the test campaigns, delivery of material, transportation to embarkation locations and delays in contract performance. It was this same commission that reported the first problems that would be some of the factors that would lead to the definitive cancellation of the contracts in 1942. 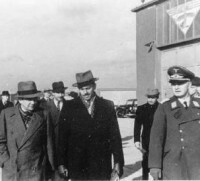 As necessary as it might be to the Army, the refit of the Force on the basis of the agreements with Germany had to be canceled. In view of the beginning of World War II, in September 1939, the material still in the factories was requested by the German government. What had already been received by the commission, was waiting for some form of transportation to Brazil. At this point it is clear the lack of resources on the part of the Brazilian government, since it did not have funds to pay the transport of the military equipment acquired for Brazil. In addition to the lack of money, the transport of the acquired material would still suffer a further setback: the worsening of the war in the Atlantic and the naval blockade of Germany imposed by the English. Of the total of 1,180 artillery pieces ordered, about 64 were delivered and 11 automotive vehicles, out of a total of 646, were received until 1941, the date of the last shipment of material purchased from Germany. The equipment acquired by Brazil, which were in deposits, were incorporated to the German forces, being their replacement for when the war ended. What never happened. As already mentioned, Brazil turned to the United States to acquire material for its coastal defense. The contract with the Americans included the purchase of 137 cannons destined for coast artillery and dated February 26, 1940, although negotiations began in September 1939. This purchase, as has already been said, hand, retired from service in the US Army and sold as "Scrap iron" to Brazil. However, the poor state of repair and wear and tear of the equipment acquired was so advanced that it had to undergo an extensive review (paid for by the Brazilian government) in American companies, and many of these pieces of artillery were practically rebuilt given the missing parts in the acquired material, as in the adaptations made for its operation in Brazil, making it proportionally much more expensive than the contract with Germany, although American equipment was received in full and German not. Far from seeking a concise and cohesive rearmament for his army, Vargas sought to combine the local needs of a military re-establishment with his policy of political and economic equidistance with the powers of his time. With no money in the treasury to spend on costly purchases of war material, he relied on trade policy with Germany to buy arms, financing them with money from Brazilian exports to that country, and at the same time incited fear for part of the North Americans' political and strategic alignment with the Berlin government, which could jeopardize North American hegemony on the continent. The famous Vargas wandering once again becomes present and remarkable in a political game that does not end with the purchase of weapons by the Brazilian government in the late 1930s but which culminates with the entry of Brazil into the Second World War the construction of the Volta Redonda steel mill with American funding and the modernization of the Army, Navy and Air Force through the receipt of American war material during and after the war. If the purchase of armaments from Germany may at first appear to be a complete failure of long-term planning and the over-reliance of only one supplier is a risk, secondly, the Vargas government has been able to deal with a need internationalization, making it an international issue that would benefit the country in the future. Germany did not need, at first, Brazil in line with its ideals, but rather a supplier of raw material for its factory park, now dedicated to the production of warlike goods. The United States, fearing the need for a future military intervention in the Brazilian Northeast and, seeking to avoid it, will yield to the conditions imposed by Vargas, such as the negotiation for the construction of a steel mill in Brazil and the supply of modern military equipment. The unfolding of events we all know: German submarines begin their campaign of sinking Brazilian merchant ships, Brazil enters the War on the side of the Allies and we receive modern military equipment from the Americans to fight in Italy and reshape the defense.